The Spitfire was, and still is, an icon of aviation history. In 1940 it came to symbolise the fighting spirit of a nation when control of its skies was the last remaining barrier to enemy invasion. Standing alone against the assembled might of German Forces, only the devil-may-care courage and sheer determination of the RAF’s young pilots, stood between Hermann Goering and his mighty Luftwaffe. 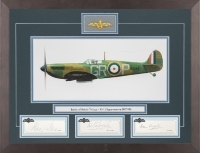 When the Battle of Britain began in the summer of 1940, although it was the Hurricane squadrons that bore the brunt of the fighting, it was the Spitfire that fired the nation’s imagination. Arguably the greatest defensive fighter ever built, this legendary little fighter, revered by its pilots and feared by it foes, earned a place in aviation folklore like no other aircraft before it or since.